Dingboche is a pint sized town in Nepal, it’s a place where mountaineers stay before they go to litter Everest. 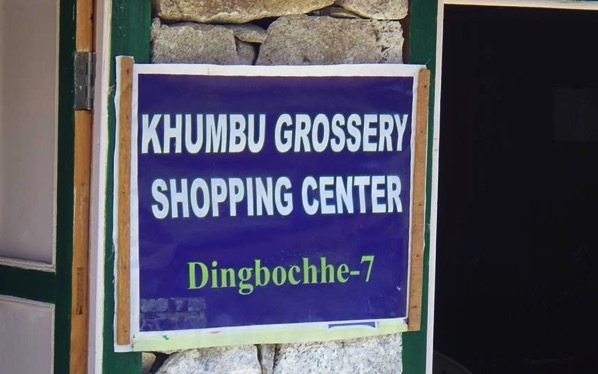 Usually mountaineers bring all of the equipment and food they need for their ascent of Everest with them, but a few use the Khumbu Grossery, Shopping Centre, quite what the Khumbu Grossery is the centre of I personally have no idea, but the Nepalese probably know. What a shame that more climbers and trekkers don’t use the shop, before they go off and spoil the Nepalese countryside with their abandoned equipment and food packaging, because then they could probably afford a decent sign.